Used JBL 43 series genuine terminals units 4 piece set F/S from JAPAN. 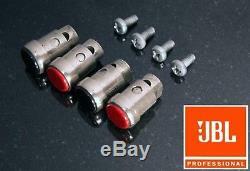 It is a set of 4 pure terminals of JBL. (2 red and 2 black). It can be used for various speakers and speaker units of JBL. 4301, 4301 B, 4310, 4311, 4312, 4331, 4333, 4343, 4344, 4355, 4350 etc. Woofer such as 2231 and 2235 H, Mid such as 2121, 2123 H, driver such as 2420, 2440, 2405, 2405 H Tweeter etc. It can be used for many units of the JBL 43 series. Please use it for replacement of breakage and aged deterioration. Since the product is USED, please understand that there are some individual differences in the state. Please let me know if you have any questions. Also, please tell me if you have what you're looking for in Japan items. International Buyers - Please Note. These charges are the buyers responsibility. The item "Used JBL 43 series genuine terminals units 4 piece set F/S from JAPAN" is in sale since Saturday, January 27, 2018. This item is in the category "Musical Instruments & Gear\Pro Audio Equipment\Other Pro Audio Equipment". The seller is "japanderful" and is located in Tokyo.